Predictions about unknown future events. Predictive analytics is that branch of advanced analytics which is used to make predictions about unknown future events. In some senses it is rather like crystal gazing – but rooted in the data and supported by advanced analytical and modelling skills. Predictive analytics relies heavily on correlations and time-series analysis and is one area where domain-specific knowledge is invaluable – actually, vital! A recent project – based on many million data points – revealed a very strong correlation between the sale of women’s shoes and Roman Catholicism. We have no information to confirm or refute this assertion which is statistically valid, but domain experience (or life experience) suggests that this is not a valid result. 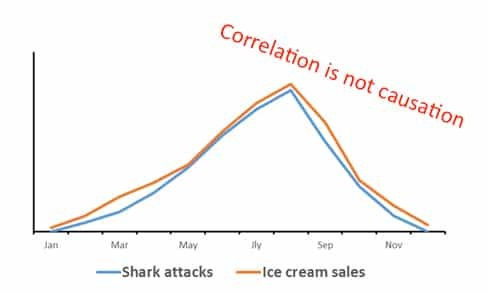 In a similar vein, shark attacks correlate very well with sale of ice-cream. The message is that predictive analytics is about forecasting which can be excellent – but which can also be disastrous. There are many examples from real life but the market leaders (Amazon et al) clearly moderate their analytical skills with a strong dose of reality. We recently carried out a major optimisation for a bank where we built a spatial model of their retail network and, after considerable modelling, predicted that they could close nearly 250 branches with minimal loss of customers. In the event, they closed 261 branches with a short-term loss of approximately 5% of their customers which recovered to just under 2% with enormous savings along the way. So, predictive analytics can work but they rely heavily on the skill of the model maker and, especially, on domain-specific knowledge.